The history of the Great War is not just about generals and statesmen. In examining the Great War, we can often overlook the real people and the real lives that lie behind the "other ranks" who served in their millions. Many died during a long and arduous campaign, and we remember their sacrifices in a number of commemorative ways, not least on 11 November each year. Now, we can also learn more about the many millions of British servicemen and women who came back. In November 2012, The Western Front Association announced the acquisition of some 6.5 million Pension Records Index Cards and Ledgers (PRCs). 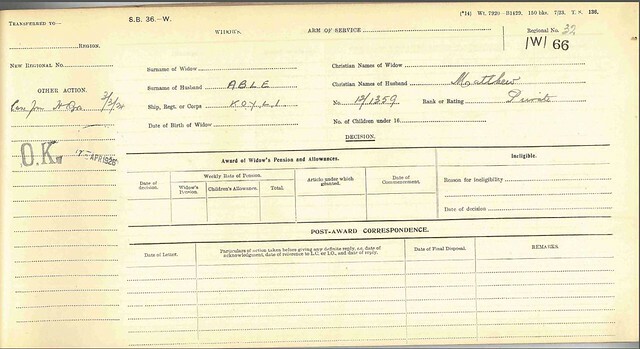 As part of the WFA's education aims, and to allow access to the records for family research as soon as possible, we are now able to offer a manual look-up service for the records. Please go to the Manual Lookup page to download the application form to apply for the lookup. Please note: there is a fee for this service which is to be paid in advance. This document, the earlier one linked to above, and subsequent articles to follow explore the records in more depth as we seek to begin to put them into context. The discussion below will also help you to decide if you wish to use the manual lookup service and what you might expect - if the records exist - from the service. The destruction of the large majority of First World War British service records in 1940 has been a significant barrier for family and military historians for many years. Although the publication of The National Archives' 'Burnt Series' records (those records that survived the 1940 London Blitz) was significant, these records account for only about 30-40 per cent of those five million or so British men and women who served in the Great War. In addition to the Burnt Series is another set of records, called the 'Unburnt Series' (also known as the WO364 series to The National Archives) . 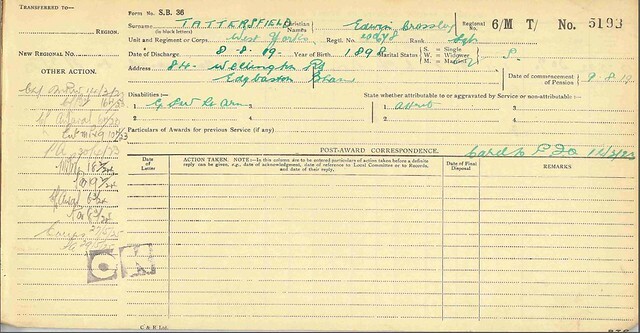 These amount to a further 750,000 records of soldiers who were discharged for medical reasons during the War. They also include some pre-war soldiers whose term of service came to an end before 1920. Despite the number of documents in both the Burnt and Unburnt series, there are large gaps in these records. The WFA's Pension Index Cards and Ledgers is likely to be a significant benefit in plugging these gaps. They will provide information to help further research with the Burnt and Unburnt records as well as in other avenues of research. 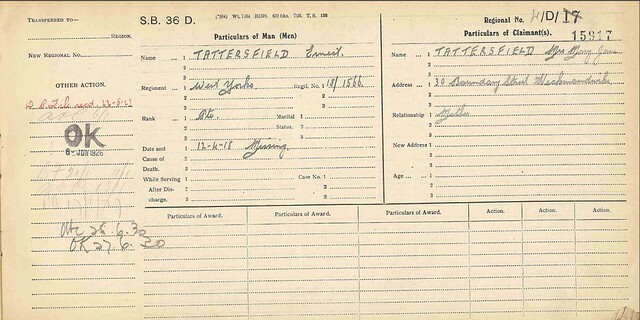 A random sample of the Pension Record Cards held by the WFA against the Burnt Series (WO364) has revealed only a limited amount of records in common, which reinforces the value of this new archive. It is notable that errors in the original records can complicate matters. The WFA's archive may be of assistance in identifying such anomalies, which may enable researchers to find the record they are seeking. For example, below is a copy of part of the WO363 record (Burnt Series) for Herbert Bischoff. Note his regimental number (5354). 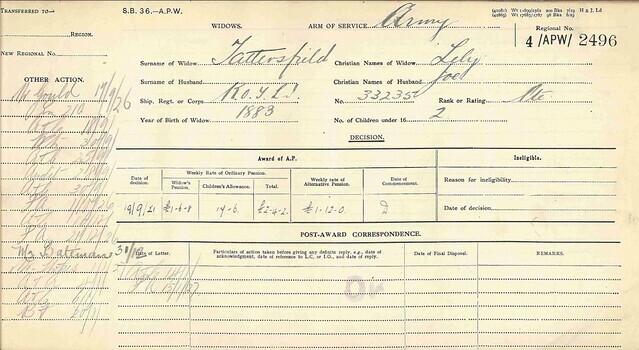 Pic 2 below: the same soldier's card from the new WFA PRC archive. The regimental number (5334) is different. Whilst the different service number for Herbert Bischoff may not have held back a potential researcher in this case, the fact that the PRCs have provided an alternative number suggests a cross check of information may be a worthwhile exercise for those undertaking research. 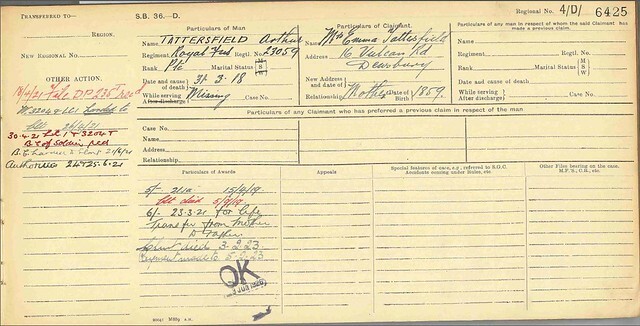 The WFA's PRCs will assist a researcher to positively identify a soldier and his regimental number(s), not least because of the extra, verifiable information contained on many of the records, such as home addresses and details of next of kin. Once this positive identification of an individual has been made, other lines of research will open up. The PRCs also potentially provide additional unique information such an individual's unit, next of kin, wounds and injuries received (or disabling ailments), recovery from wounds and injuries in the post war years and pension entitlement. Ledgers. (Some weeding of these ledgers is evident, which probably took place in the 1950s and 1960s. Details of this weeding appear below.) There are some 15,000 ledgers, and each ledger contains 100 individual records, Thus there are about 1.5 million individual ledgers. Various types of record card. Once a ledger was written for an individual, it is likely an index card was created detailing the unique reference number for the ledger. These index cards were then filed alphabetically in different 'runs' – the run depending on the type of ledger that the card was used to index. The reference number for each of the 100 entries per ledger is prefixed by the regional number, followed by a two letter code. The first letter of this code is either N (for Naval) A (for Airmen) or M (for Military (ie Army)). The second letter of the code is the first letter of the individual's surname. Then follows a number which starts at "1" and follows in sequence up to the end of the initial letter of the surname. Thus we could have 6/MA/0001 for (theoretically) a soldier called Private Aardvark who lived in the Midlands, up to 6/MA/9999 for Private Aztec from the same region who was also in the Army. 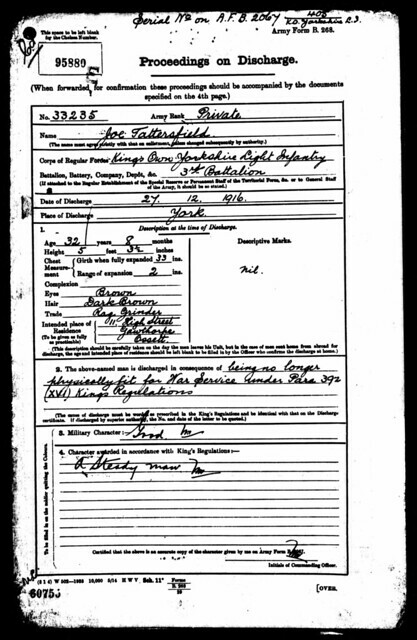 13/AM/1234 would be an Airman with a surname commencing "M" from Southern Ireland, and 5/NJ/4321 could be a Naval Rating from Wales called Jones. This group comprises about 650 ledgers (65,000 individuals). Again they are split regionally and all regions except the unallocated 9 and 10 are present. The largest single region is region 11 with over one-third of the entire widows' records. This suggests that (assuming the proportion of region 11 records was the same for the Disabled Soldiers, Naval Ratings and Airmen) approximately 19,000 ledgers (1.9 million individuals) from region 11 have been weeded from the Disabled Soldiers, Naval Ratings and Airmen section. The coding of these records is in the format of Region / W (for Widow) / sequence number. This section comprises some 2,300 ledgers (about 230,000 individuals). All regions are represented. They are coded Region / D (for Dependents) / sequence number. There are some regions missing. For "APD", regions 5, 8, 11, 12 and 13 seem to have been weeded and in "APW" regions 8 and 11 do not exist. APD contains approximately 80 ledgers (8,000 records) and APW some 340 ledgers (34,000 records). Any disabled man in receipt of pension who makes application and shows that the pension with children's allowances (if any) which he has been granted, together with the average earnings (if any)of which he remains capable, are less than his pre-War earnings, may be granted, temporarily or permanently, in lieu of the minimum pension and children's allowances, a pension which, together with the average earnings (if any) of which he is judged capable, shall not exceed his pre-War earnings up to a maximum of 50s. a week, plus half of any pre-War earnings between 50s. and 100s. a week. Any widow pensioned .... who makes application and shows that the minimum pension, with children's allowances (if any), which she has been granted is less than one-half of any alternative pension that might have been awarded to the deceased soldier had he survived, may be granted, in lieu of a minimum pension and children's allowances, a pension which shall not exceed one-half of such deceased soldier's alternative pension. The pension issuable to a widow is increased by 1s. 3d. a week when she reaches the age of 45. There are some minor anomalies in this latter group which we are still researching. 4i Officers Died and 4ii Widows of Officers (The combined number of cards is approximately 150,000). 5 Mercantile Marine (less than 5,000 cards). Not all of these cards bear a reference that is meaningful. 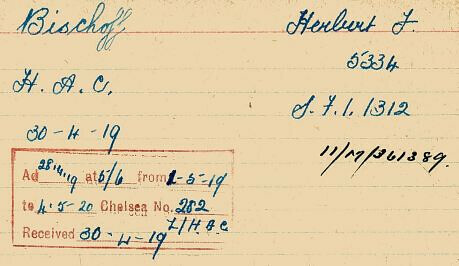 For example, the Herbert Bischoff card shown above provides a number 11/M/361389: this does not refer to any of the records the WFA has acquired. It is possible that this is a reference number to the Unburnt Series file, but at this stage there is no evidence of such reference numbers appearing on both the Unburnt Series and the Index cards. Some of the references are to ledgers that are known to have been weeded. There is some evidence that certain reference numbers on a few Unburnt Series records are common with reference numbers on the cards: see "Chelsea Numbers" mentioned below. Within the (widows and dependents) section is a sub section alphabetically located under the letter "I". This is "institutions". Cards for [Town] Waifs and Strays Home and [Town] Childrens Home are present. Each card lists the payees of pension who were resident in these institutions. 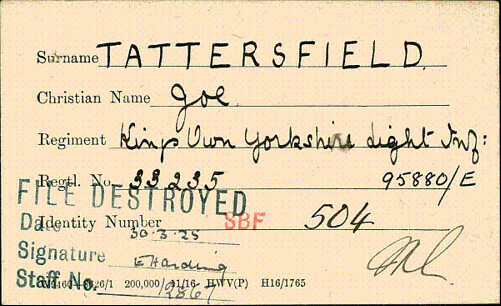 Here - Pic 10 below - is an image from WO364 (courtesy of Ancestry.com) for Private Joe Tattersfield, number 33235, KOYLI. 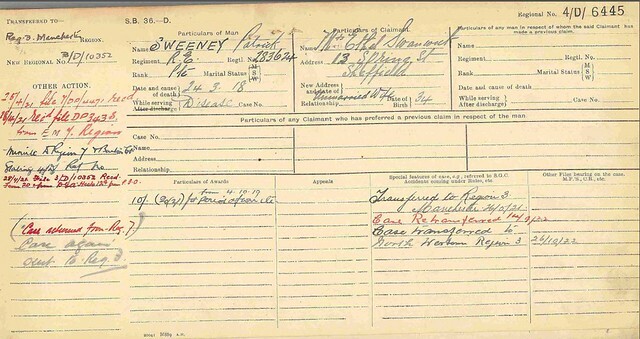 And here - Pic 11 below - is the card for this same individual from the WFA records. 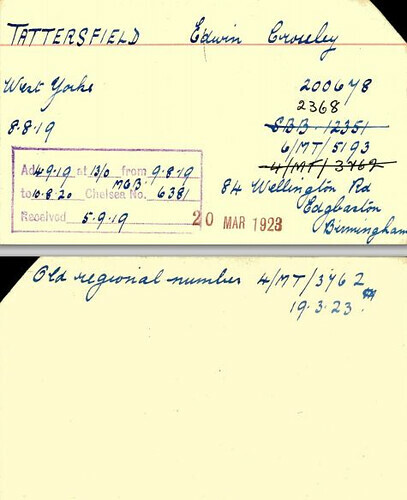 Further research is needed to link the two sets of documents, but the 'Chelsea number' of 95880/E is common to both documents. This document above explores the PRCs in more detail. We continue to learn more about the archive and we will provide further briefings as more analysis and understanding is forthcoming. As mentioned earlier, you can now request a manual lookup of the PRCs for a given subject. Please visit the Pension Record Card Lookup page for details on how to apply.